Understand the basics of personal injury settlements. There are two main routes to injury claim settlement: settlement with an adjuster without a legal claim, and settlement with a lawyer before or after filing a legal claim. A settlement means a resolution to your claim without the matter going to trial and being decided by a judge. In Nova Scotia, the vast majority of legal claims settle outside of court. This means that victims of car accidents, slip & fall accidents, or other forms of injury claims are resolved without ever stepping foot in a courtroom. A settlement brings closure to the legal claim. The victim will receive money in a lump sum for their injuries. The insurance company will get to close the file and know that the victim will never pursue compensation for that injury again. A settlement happens when an insurer or a defendant makes a financial offer to an injured person to compensate them for injuries and losses. The settlement offer must be accepted while the offer is open for acceptance. The insurer or defendant is able to make a limited-time offer, or revoke an offer at any time prior to acceptance. When is a settlement offer made? Once the injured person is discharged from treatment. Prior to the limitation period for the claim. After discovery hearings have occurred during the course of a legal claim. The settlement offer generally comes with certain terms which much be accepted along with the financial sum offered. The terms generally require the injured person to give up the right to make a legal claim against the insurer for the injured complained of, stop any active legal claim in relation to the accident against the insurer or its insured, and not speak about the terms of the settlement to anyone other than direct family, lawyers, and financial advisors. In short, once you settle it’s all over. 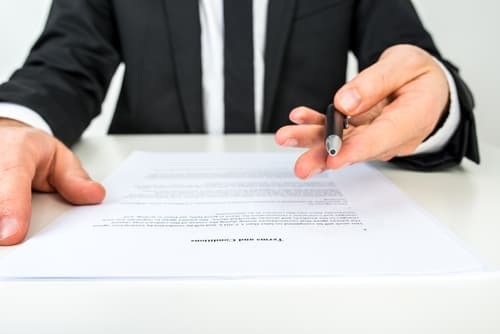 Signing a release is a standard part of the settlement process. The wording of the release is often standard. The release itself is drafted by the insurance company and provided to the injured person for signature. An original signed copy of the release is usually required by the insurer before settlement funds will be issued. For example, in a car accident case, the car insurer may offer the plaintiff $50,000 to settle the case. The plaintiff, in order to receive that $50,000, would have to communicate acceptance to the insurance company that made the offer while the offer was open for acceptance. Acceptance would also require the injury victim to agree to the terms as set out in the settlement release. Settlements are almost always offered when there is an insurance company involved in a case. An insurance company is usually involved in a case because there is a policy of insurance which will respond to the claim advanced by an injured person. For example, the insurance company for the at-fault driver involved in a car accident will respond to the injury claim of the person who was hurt because of the negligence of their customer. There are some cases, however, (not generally in motor vehicle cases) where there may not be an insurance policy to cover the claim. Consider the case of a victim of an assault. The victim can commence a claim against the attacker, but there is not likely to be an insurance policy that will respond to the injury claim. A car insurance policy will not cover the incident because it does not relate to a vehicle accident. A homeowner insurance policy is unlikely to respond because most policies exclude coverage for illegal acts. In the case where no insurance policy is triggered, reaching a settlement is less likely because the financial award would be provided by the would-be defendant personally. If the assaulter has no assets, there will be a barrier to settlement. In short, nearly all personal injury claims will be advanced against an insurance company, be it the car insurance company, the disability insurance provider, or a homeowners policy provider. Settlements are popular in the personal injury context because insurance companies are involved. The insurance company is a business with shareholders who expect a profit. It doesn’t benefit the insurance company to pay expensive lawyers for months of preparation for a trial that they may lose because their insured was responsible for the accident or injuries. Instead of paying the lawyer and risking a significant award being made by a judge or jury, most insurer’s perform an economic calculation and turn to settlement as the most logical route to resolve the claim. In cases where their customer is at fault, a fair settlement just makes good business sense to them. Insurance companies insure risk, but they don’t like to be risky. If they know that their customer was at fault, they know they are likely to lose at trial. The question then is how much the victim will be awarded by a judge or jury if there was a trial. The insurance company is nervous about the uncertainty of a trial. Will a jury be sympathetic to the victim’s story? Perhaps the impact to the victim is more severe than expected and the judge awards a larger than expected award. Uncertainty can be avoided by settling the claim. The settlement allows for cost certainty and allows the insurance company to forego a risky trial. A settlement allows the insurance company to control what they are willing to pay to close the claim. Insurance companies hate bad press. The settlement allows a company to get closure and control their image. Consider the case where a health food company put out a faulty product that hurt someone. Or the case where a drug company accidentally mislabeled a medication which caused a severe reaction to a child. A lawsuit or trial will cause massive media exposure. The company will see details of the claim in the newspaper and the public will lose confidence and trust in the brand. The company’s value may decline because of the bad press. These companies are very keen to settle negative-press claims and have the victim sign a release with a confidentiality clause. Of course, the claim must be substantiated before any Defendant will pay for losses. Settlement brings closure to the victim. Legal proceedings can drag on for years, which means that the victim won’t be compensated until the matter is finished. Many victims need money to help offset their lost income or pay for necessary medical care. A plaintiff may also not want to go through the emotional and frustrating processes required to win the legal claim in court. There is no risk to the victim if the case settles. There is no chance that the victim could lose at trial and be left owing legal fees to the winner. What if Settlement Attempts Fail? In most instances, settlement should be attempted. Settlement discussions don’t always result in a settlement. The parties may simply be unable to agree on a result that is fair. If the case can’t be settled out of court, then a trial will be necessary (unless the claim is dropped). Settling claims can be complicated, depending on the nature of the accident, or the extent of your injuries. You may be well served to seek out a consultation with a personal injury lawyer prior to considering or entering into settlement discussions. Most personal injury lawyers work on a contingency fee basis, meaning you are not out of pocket for any legal fees until you receive payment of your claim award.